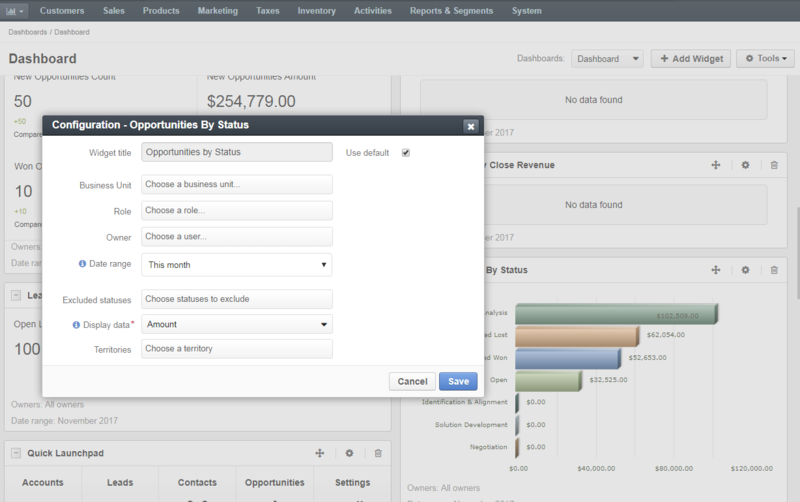 The Opportunities by Status widget displays the breakdown of opportunities by status in a form of a bar chart. Excluded Statuses — select what status the widget should not display (e.g. Closed Won). Display data — choose which data to display on the chart. The count shows the number of opportunities in a particular status, and amount displays their total budget. Territories — if sales territories are enabled in your system, you can view opportunities filtered within one or several specific territories. You can select whether to display opportunities amount or count, as well as select the necessary data range, role, owner, etc.